After riding the 2015 Cervelo R5 for a total of 12000km, she had to retire after smashing her fork on a simple descent . While recovering from my injuries, a close mate managed to source an RCA, which has been a dream bike ever since. - Changing the cranks, but I love the feel of qrings and i think therotor powermeter system is the only one that's capable of reading it accurately, I may be wrong though. Last edited by exctasy on Wed Apr 10, 2019 9:28 am, edited 1 time in total. What a good looking bike. I especially like how well balanced it is with the fairly shallow wheels. Very well done. But where oh where is the weight of the bike??? Speedplay / Dulight Ti - 142g - Will save you 106g. Tune DC-130 - 37g (mine weighed 33g) - Will save you 25g. That's 131g for not a lot of money really! I like the splash of red on the fork. Looks sleek. I’m shocked this isn’t lighter! Looks awesome though! How much do the wheels weigh? Solid build. There's a bunch of easy places to save weight and some not so cheap places haha. The pedals, saddle, skewers, and groupo are probably the heaviest parts. wheels should be approx 1138grams. will be changing my skewers to tune soon! Oh wow, twins down to the frame size, and the frame you rode before. Congrats! Great looking build. How are you liking it so far? I found that I preferred the ride of the RCA by a considerable margin to my old R5. I'm curious if you've had a similar experience. I was smiling when i hopped on the rca. Only did a short 40km ride so far on her and yes, there's quite a difference to the R5, with similar parts and wheels. Weighing in at 56km and not a wattage bazooka, I dont know how much stiffer this is. I do know, the rca definitely feels more responsive, on the flats. 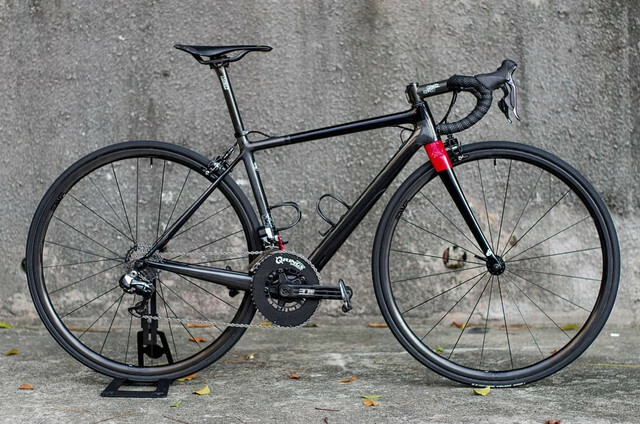 I love how the R5 rides when the gradient gets steeper, would love to see how the rca feels upwards. nice bike. the enves are heavier as expected. How nice to see an RCA. Always been curious of these. Quite a pity they ended this model..
by chuuurles » Fri Sep 21, 2018 2:23 am » in Introduce Yourself / Gallery - Please use metric weights. by jelledb » Sat Sep 08, 2018 11:59 am » in Introduce Yourself / Gallery - Please use metric weights.